Washington (CNN) - Retired Gen. Michael Hayden said Sunday the United States has all but conceded Iran has the right to enrich uranium. "We have accepted Iranian uranium enrichment," Hayden said when asked about the agreement reached last week between Iran and the so-called P5+1 - the United States, Britain, China, Russia, France and Germany. Hayden, a former director of the CIA who served in both the George W. Bush and Obama administrations, expressed a less critical view of the deal than most Republican national security hawks, saying he's willing to let this agreement "run." "It's not like we had a whole lot of good choices," Hayden told Chris Wallace on "Fox News Sunday." While Hayden said the accord with Tehran changed "the redline that we used to have," he admitted the agreement does give the world an opportunity to prevent Iran from producing nuclear weapons. 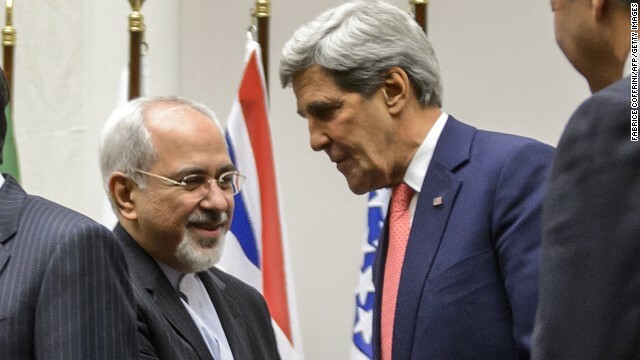 The former National Security Agency chief added that, although Iranian President Hassan Rouhani and Foreign Minister Javad Zarif may not be moderates, the pair might still be "the best deal we can get in terms of interlocutors within the Islamic Republic." Hayden doesn't think we need to bomb Iran today. That is different from what the republican chicken hawks in congress and Fox are selling. The Right would like everyone to believe that nuclear technology is hard. It IS technical, but not hard. The genie is out of the bottle, and like other "Cold War" threats, nuclear technology will continue to proliferate across the world- the U.S. (and other world powers) are powerless to stop it. That the Iranians are willing to enrich uranium ONLY to the level that supports clean nuclear power plants is actually a good thing. Perhaps 40 years as a pariah nation has convinced them to change their ways. Diplomacy is always a viable option. War is the first choice of cowards. In other words, they will not act to stop it. ".........the agreement does give the world an opportunity to prevent Iran from producing nuclear weapons........."
You can't have it both ways. Diplomacy is always worth a try. At least Hayden understands that, and he should know. Recipe for disaster, compliments of the Obama administration. That is enough ntalking about America. That reminds me of you sages opting for that gym freak automaton who tanked you before Jerry had to make an unscheduled return to save your butts. "Former CIA head: U.S. has ‘accepted Iranian uranium enrichment’"
An inalienable right which was never in dispute or contested by world community. Like the concept of World War, don't ya' Ricky? What is Hayden talking about? The NPT allows uranium enrichment. These folks want war and more war forever. Why can't Iran enrich uranium to use in power plants to produce electricity and try to improve their economy? If they keep the level of enrichment just low enough to provide this electricity and not escalate it to nuclear weapons level, what is the matter with that? It is a sovereign nation and should be able to have peaceful uranium enrichment. Now if they are seen to be breaking the agreement, then the US, Germany, France, England, China and Russia have every right to bring back the strict sanctions again. It is up to them. This agreement is far superior to bullying and bombing. Fath: "That reminds me of you sages opting for that gym freak automaton who tanked you before Jerry had to make an unscheduled return to save your butts." As long as they only enrich to fuel a reactor and not a bomb (which takes far, far greater enrichment) why not? Doesn't the Right love nuclear energy? So, when they give some dirty bombs to the bad guys.. and they will... and set one off at your local mall.. would all of you still think they have "right" to have nuclear technology? With conditions Mr. Hayden, with conditions. Like they were going to stop ? The world will not allow the Iranians a nuclear bomb .